Keeping with Razer tradition, the Lachesis is named after yet another venomous snake. I’ll start off with some specifications. Using the drivers you can save button bindings and macro’s to the memory inside the mouse. When you take the mouse to a PC that doesn’t have the Razer drivers, you can still use the settings in this memory. This way you can use advanced macro’s without the drivers. You’ll only need to drivers to save them to one of the 5 available memory-profiles. Using two buttons you can change the DPI in 125DPI intervals. This is again possible without drivers (as long as you keep two buttons bound to DPI changing of course). By default, USB mice report 125 times per second (125Hz). The Lachesis can report 1000 times per second. This will cost you quite a few extra CPU cycles, but will make the mousecursor move smoother. I don’t use 1000Hz, but 500Hz, because I can’t feel the difference between 500 and 1000Hz ingame. Besides the specs there is the shape of the mouse. It’s an ambidextrous design, which means both lefties and righties can use it. Compared to the Razer Deathadder it’s a rather small mouse. A lot flatter and less ‘fat’. If you have big hands it might be a bit too small. The Lachesis has a lot of buttons. 4 on top (5 if you count the scrollwheel), 2 on the left side and 2 on the right side. You can only use either the left-side buttons or the right-side buttons (depending on if you use your left or right hand). Compared to the oversized sidebuttons of the Deathadder the side-buttons on the Lachesis feel small. 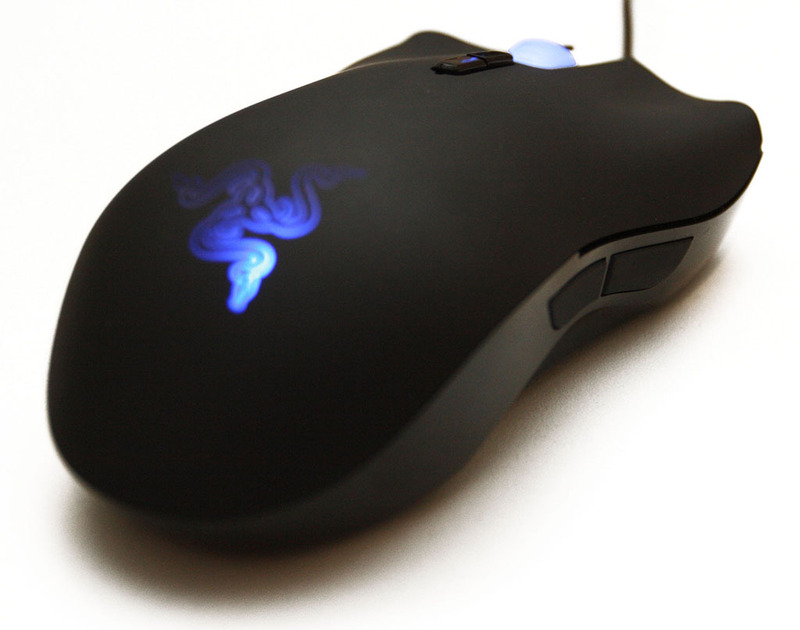 The entire mouse is covered in a kind of rubber, the same used on the Deathadder. Like all Razer mice, the buttons are more sensitive comared than you’d expect from a normal mouse. This might take a while to get used to, but in my experience it makes your clicks register slightly quicker. Scrolling feels exactly the same as on the Deathadder, almost silent and with very good feedback ‘clicks’. The mousefeet are made of the Razer-standard teflon. Which ensures smooth movement across your mousing surface. The drivers installed without problems. They look a lot like previous drivers and even have the same BSOD-inducing bug the Copperhead and Deathadder have. 4. When you get home you log out USER2 or use ‘fast user switching’ to switch without logging out. 5. Approximately 10-30 minutes later you’ll get a blue screen of death directly after pressing a mouse button. Besides this annoying bug, the drivers worked perfectly. Sure you can use this mouse on the desktop, but it’s meant to be a gaming mouse. So the natural thing to do was to start up Team Fortress 2 and start fragging! Ingame I bumped the DPI to 4000 and lowered my game-sensitivity to compensate. This way I got the most precision while maintaining my normal mouse-movement-to-ingame-view-turn ratio. I normally use a Deathadder which is a right-handed mouse. The Lachesis being ambidextrous and smaller took a while to get used to. After an hour of fragging I mastered the Lachesis and played as well as with my Deathadder. The mouse is easy to hold, the buttons are easy to push and headshots are almost automatic. A very pleasant experience. However, I did start to experience some annoying quirks. While I was playing as a sniper, I had to lift the mouse off my mousepad (Razer Exactmat) to keep tracking an enemy. When the mouse left the mousepad, my sniper suddenly looked down. Simply every time I lifted the mouse, the view of my brave soldier would shift down a bit. Being a sniper is almost useless like this. Another problem I found was ‘ghost movement’. Sometimes the mouse just shifts your view up/down/left/right. It only happened once very five minutes, but it also seemed to happen just when I was in combat. Yet another problem is something I’ll call axis-lockup. This means that sometimes, for whatever reason, the mouse stops responding to all movement on a certain axis. You’ll either only look up/down or left/right. This ‘lockup’ only lasts a second, but is very annoying. I tried switching mousing surface from my Razer Exactmat to my desk (white with some texture). Ironically this surface worked better than a Razer-brand mousepad. Still, the quirks remained. Today, Razer released a beta firmware aimed at fixing these problems, but unfortunaly it didn’t fix these problems for me. These sensor problems should have been caught by Quality Control. I experienced these problems within the hour, there’s no way this could/should have slipped by QC. Obviously the Lachesis is a mouse with a lot of potential. Extremely high resolution, movement speed and a good design should make the perfect combination for a great gaming mouse. Unfortunately the bugs in the laser sensor make it impossible to recommend this mouse to anyone right now. Also it’s a rather expensive mouse when you compare it with the Deathadder and Diamondback 3G. Both of those don’t have the sensor bugs and have been around for a while.. So to sum it up. If you’re looking for an ambidextrous gaming mouse, buy a Diamondback 3G. If you’re looking for a right-handed gaming mouse, get a Deathadder. If you want the latest and greatest gaming mouse, wait for a firmware that fixes the bugs in the Lachesis. To be fair, the Deathadder had some problems when it launched as well. Fortunately a few firmware updates fixed those. Let’s hope the Lachesis gets the same treatment and ends up being just as good as the Deathadder. This entry was posted in ariekanarie.nl, Hardware and tagged 4000, dpi, lachesis, laser, mouse, razer, review by Arie. Bookmark the permalink. While I was testing some drivers of its predecessors, I also noticed the reproducible BSODs. I forcefully terminated “razerhid.exe”, and after a while, the system suddenly crashed. Although I didn’t bother to investigate it any further, I guess its some invalid handle/pointer in the kernel driver, because user-mode code should not be able to provoke this. Well I work around it by taking razerhid.exe out of the general startup files using msconfig. I’ve put it in the startup folder of a single user. Hey Arie, do you have tested with the last firmware and drivers to see if the bug of sensors has been fixed ? I haven’t tested 1.75 (it only fixes unrelated problems), but 1.64 didn’t bring the Lachesis close to the Deathadder. The skipping and axis blocking were mostly gone, but the firmware introduced movement lag and still had the Z-axis tracking problems. I stopped bothering with the Lachesis late june when I sold it. As of October 31st the Lachesis has been given another firmware update: 1.91 which has fixed the jumping issue and some other problems. All signs point to it finally being good to go. A year after release. Yeah I read on Razer Blueprints that the new firmware is supposed to fix a lot of stuff. However, the Z-Axis tracking issue is not fixed, so I still consider it broken. Got any recommendations of mice to check out that DO offer more? My current mouse has left and right click, mousewheel up, down, and center click, and two thumb buttons that I all use frequently… but I am looking for a mouse with at *least* 2 more (programmable in-game[warcraft] buttons) that isn’t as huge. I’d thought about trying out the new “made for wow” mouse, but the thing’s enormous and I have tiny hands so sadly that’s not going to work. Anyway, if you know of anything you could suggest that’d be fantastic! The Diamondback 3G has left, right, mousewheel, 2 buttons left and 2 buttons right. But those buttons are hard to reach/press. The new Razer Mamba has 7 buttons, but it’s very expensive. Maybe a Razer Copperhead would be nice. It’s very much like the Diamondback 3G, but it has better side buttons. I do think it’s End Of Life so it might be hard to get. dude, the axis-lock is you pressing one of the side buttons with it set to profile switching. set it to mouse4/mouse5 instead using the razer software. the mouse buttons are all seperately programmable – for instance, I use the left front button as Ctrl-A, the right front as Ctrl-V and the right back as Ctrl-C, with the left back button set to a macro for photoshop. So your whole logic of setting it to 4000 DPI and lowering your in-game sensitivity is erroneous. If you lower the ‘hardware’ DPI of the mouse, a game will receive less mouse inputs, which will force you to increase your sensitivity, which will increase the ‘gaps/angle’ of your crosshair movement. Are you running the latest firmware and driver? I got a Lachesis about 5 months ago. Best mouse i’ve ever used. Never had a single problem with it, I think its just cause you reviewed it when it first came out and its firmware was old and crap. I do recommend this mouse over any, including the Logitech G500. I am using Vista x64 with the Razer Lachesis. The problem is I have to keep reinstalling the driver because after a while the as I move the mouse it seems to lag and skip, it’s hard to describe. So to get into more detail, for example, if I move the mouse smoothly, the pointer will first move smooth then slow right down for no reason then speed up and do this multiple times in one mouse movement. I have never experienced this before. It is a pain in the a**. I paid £80 for this mouse. It does not even seem like Razer are even trying to fix their driver! @Brett, I got the same issue. Mouse wont move. Did there support team get back to you with a result?